Some projects are more challenging than others. Consider, for instance, jobs requiring cranes rated for 100 + tons. Only the strongest and toughest make the grade in these situations. The Crane Guys knows this. Which is why we’re well-stocked with the finest heavy lifters. When it comes to 100 ton crane rental, our inventory is extraordinary. Many projects benefit from our 100 ton crane rental service. One of our recent Los Angeles assignments tasked our team to lift pavers and trees all the way up to a pool deck. The distance from ground to destination was a mere six floors. A recent project in Signal Hill also challenged our team. This was no generic, just-another-day, mission. No. This one involved a full-size oil pump – you know, the kind you see off the side of the road. We had to hoist one of those monsters. For this job, we selected one of our toughest machines – a 140 ton-rated hydro. And we’ll never forget the great rebar cage mission. 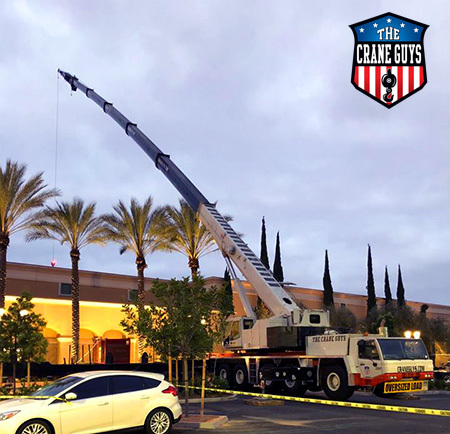 Taking place in busy L.A., this job required one of our 200 ton-rated mega-cranes to lift a set of rebar cages. Many other real-life examples could be referenced. But then, there wouldn’t be room to mention another important component of our 100 ton crane rental service. That component is The Crane Guys’ honored and highly-respected team of riggers. No finer support team ever was deployed. Volumes could be said about the importance of riggers. But that’s for another time. For now, it’s enough to say that no mobile crane or boom truck ever could be deployed without riggers. And with The Crane Guys, you can count on the industry’s best. When our riggers launch themselves into a task, they bring years of experience and the most thorough training on the planet. Every rigger on our team has been fine-tuned to the highest skill level with an incomparable training regimen. No one takes the field unless they pass this in-depth service. But in the end, it’s worth it. Our riggers emerge qualified by the industry’s highest certifications, such as the highly-respected OSHA designation. This guarantees excellence in every hydraulic crane rental project we accomplish. 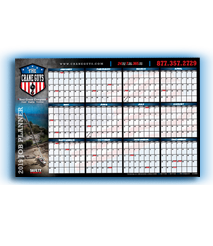 Whether they’re connecting cables or adjusting spreader bars, our riggers bring the very best to the table. Also providing needed support is our lineup of boom truck rentals. These have plenty in common with our cranes. Both are well-maintained to maximize safety, precision, and overall performance. And both are unfailingly reliable. Where they part company is in their range of motion. 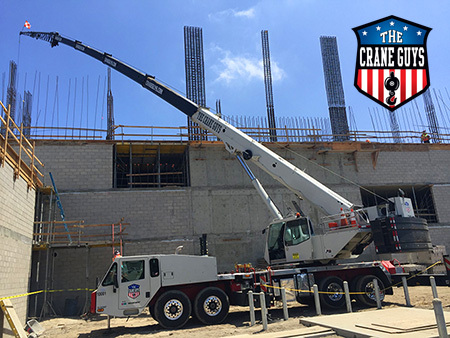 While 100 ton-rated cranes demonstrate raw machine power, boom trucks provide quickness and agility in tight spots. Give them a limited space, and they’ll slide right in without a hitch. And now the question many are asking – how much will our 100 ton crane rental service cost? Probably less than you’d think. You see, The Crane Guys offers what should be front page news – The Crane Guys 5% guarantee. This promise assures clients that we’ll beat any written offer from a competitor by 5%. And you can take that to the bank.